Ajahn Brahm Meditation Retreat is back! 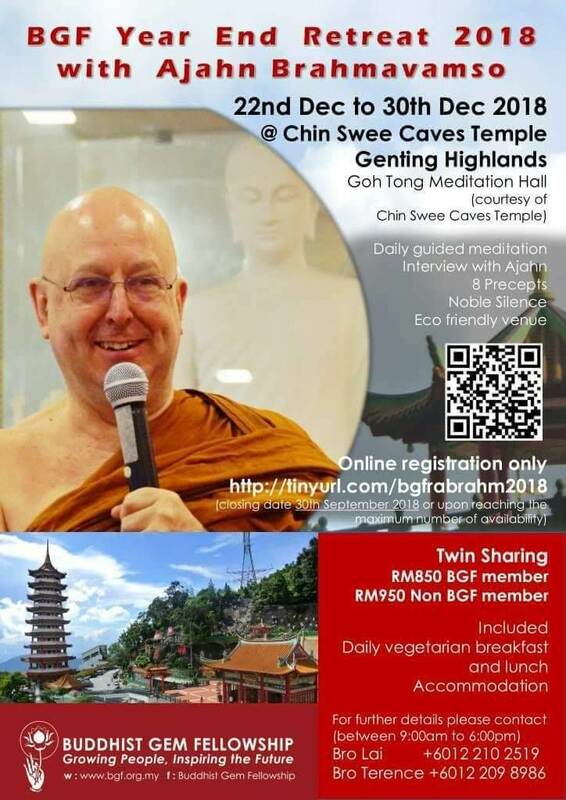 The BGF year end 2018 retreat will be held from 22nd to 30th Dec at Chin Swee Caves Temple, Genting Highlands. This will be the longest retreat so far organised. Online registration will be open on 15th April 2018 for BGF members. Non BGF members can apply from 1st May 2018. We are expecting a huge number of interested participants, so please register early to avoid any disappointments.Reservations is on first come first served. There are ONLY 25 slots for single rooms. All participants are required to observe 8 precepts and Noble silence throughout the retreat. (3) Scan and email a legible copy of the bank deposit slip as proof of payment to : bgf.retreat@gmail.com.